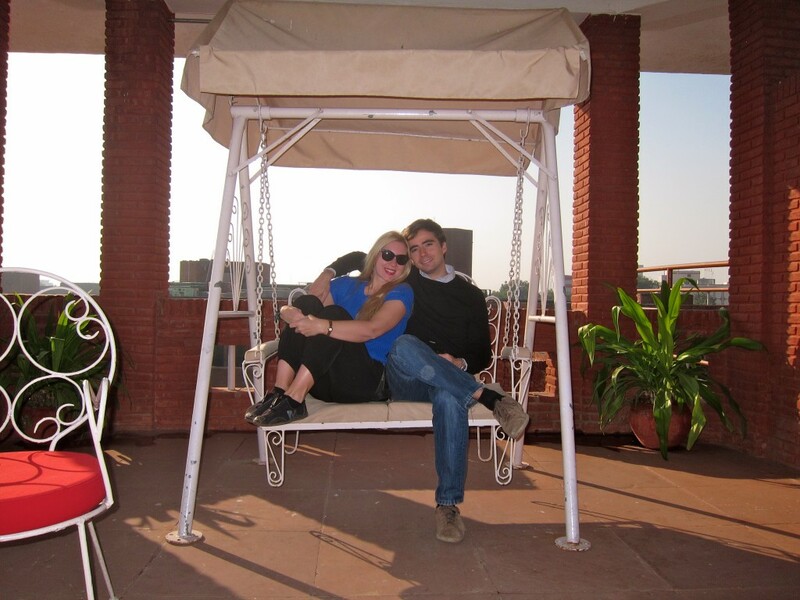 After spending a day discovering the ancient cities of Vrindavan and Mathura, Dimi and I arrived to our hotel, ITC Mughal, in Agra very late at night. 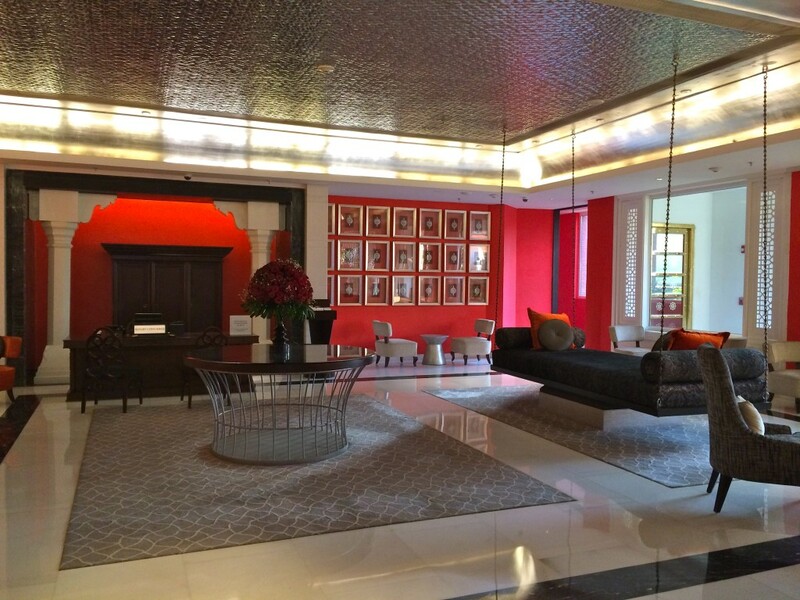 The hotel is an oasis among the dirt and ugliness of the city. I have read a lot about Agra and its importance as a Mughal capital, 300 years ago, but, unfortunately, very little dignity is left from that time. Behind the car window, it seemed hectic, over-crowded and filthy. Agra was first mentioned in Hindu epic Mahabharata and by Maharshi Angira in 1000 B.C. However, it is generally accepted that Sultan Sikandar Lodhi, the ruler of Delhi Sultanate, established the city in 1501 (or 1504) and it stayed under Lodhi Dynasty’s control, till it collapsed in 1526 when Babur from Afghanistan won the battle of Panipat. The golden age of Agra reached its peak between mid 16th-mid 17th centuries under the rule of Mughal kings Akbar, Jahangir and Shah Jahan. Babur, a garden lover, laid out the first formal Persian garden – Aram Bagh (garden of relaxation); his grandson Akbar raised the ramparts of the Red Fort and made Akbarabad (modern Agra) a center of education, art and religion. 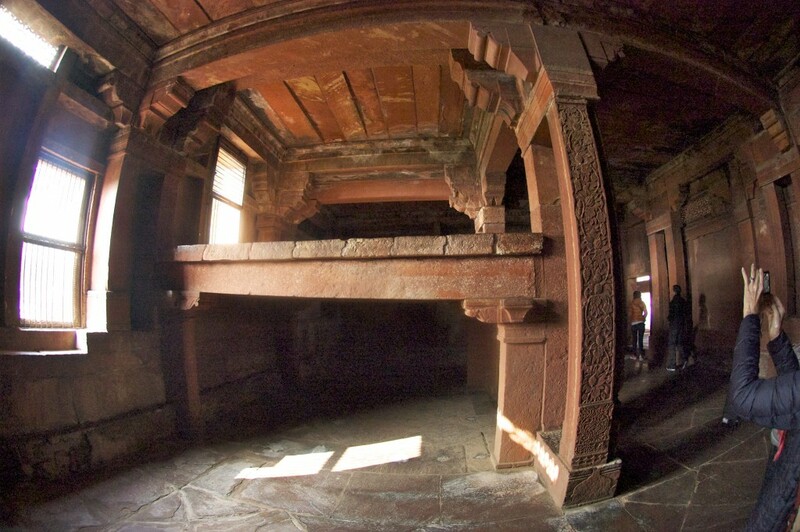 Akbar also built Fatehpur Sikri following the advice of a Sufi who predicted the soon birth of Akbar’s sons. Jahangir laid out and planted many gardens within the Fort and the city. While the most “productive” Shah Jahan built what is now one of the wonders of the world – Taj Mahal. Later, Shah Jahan shifted the capital back to Shahjahanabad (modern Delhi) where he built Lal Qila and Jama Masjid, but his son, Aurangzeb, usurping the power and imprisoning his father in the Akbarabad’s fort, move the capital first back to Akbarabad and in 1653 to Aurangabad. After the decline of the Mughal Empire, the city fell to the Jats who looted the monuments, including Taj Mahal and later the city came under the influence of Marathas and was renamed to Agra, before falling under the influence of British Raj in 1803. ITC Mughal was a great choice with nice spacious rooms, great amenities and buffet services for both – breakfast and dinner. Staff was accommodating but not overly eager to assist. In the evening, we went to the restaurant to have dinner. After being seated, a waiter brought one menu and gave it to Dimitris. We waited for long enough for a waiter to find another menu for me, however, he never came by our table. I called him in and asked for a “menu for women”, as I knew he was ignoring me because I was a woman. 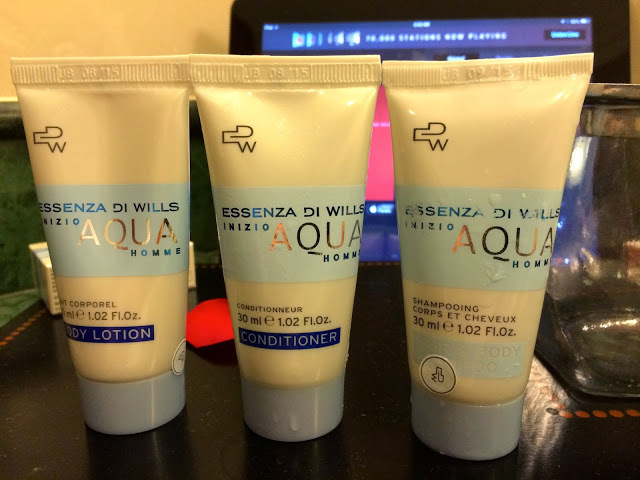 But what can you expect from the hotel which toiletries are made solely for men? Indians are indeed male chauvinists and sexists, which I experienced on many more occasions. I have researched the guide services in Agra and hired Deepak Sharma (Rs.1650 for a day) based on his great reviews on tripadvisor. We scheduled a meet up at 8 am, however, instead of coming himself, he sent another guide – Sankalp – to take us around Agra. Later in the evening, I received an apologetic email from him, explaining that his mother got sick and he couldn’t make it himself. I didn’t believe him, but Sankalp did a very good job and despite the commission of sales and extra (imaginary) fees he asked us to pay, we still enjoyed his services. 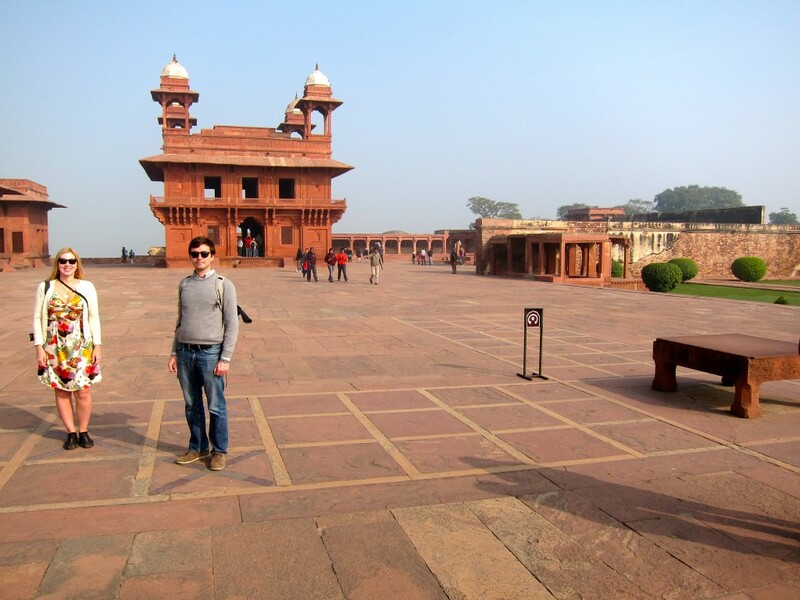 At first, we drove to Fatehpur Sikri, a short-lived capital of Mughal empire. According to a legend, in 1569 Akbar the Great went to a village Sikri to consult with a Sufi saint Shaikh Salim Chishti. Akbar’s all male heirs were either stillborn or died in early childhood and after 14 years in power, he still didn’t have a male heir. Shaikh predicted a soon birth of a prince, under the condition that the Emperor would let his wives remain in the village. 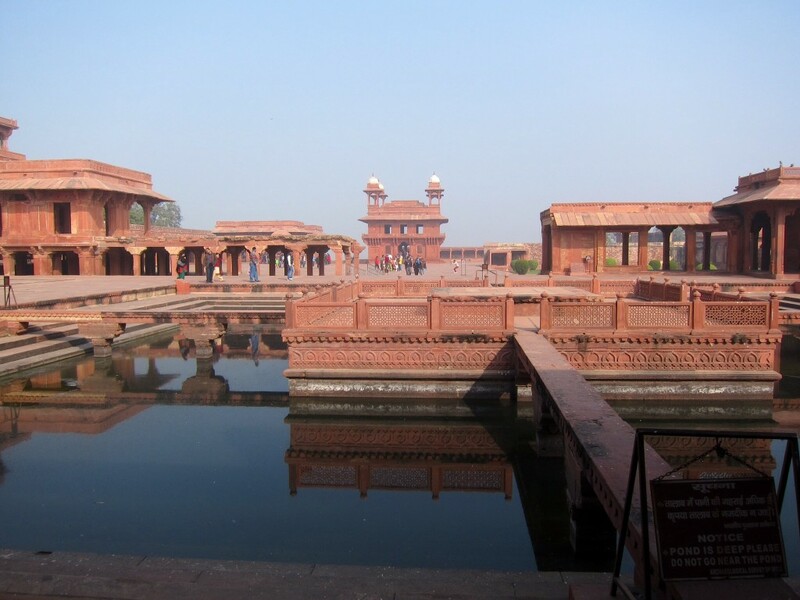 Thus, a palace and a mosque were built and the capital was moved from Agra to Fatehpur Sikri from 1571-1585. Akbar, trying to revive the splendors of Persian court, himself planned and oversaw the construction of Fatehpur Sikri. 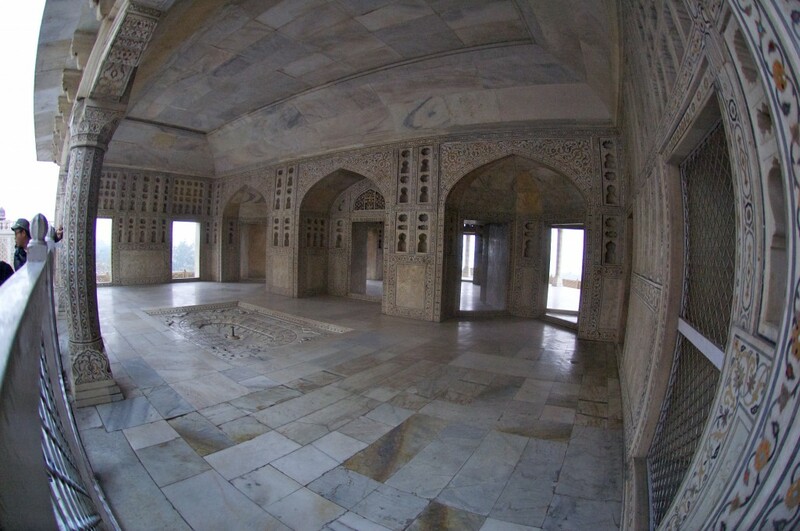 However, due to water shortage, the place was soon abandoned, but not before Akbar’s wives indeed bore him 3 sons – Salim (future emperor Jahangir), Murad and Daniyal. Fatehpur Sikri consists of multiple beautiful halls and gardens; we entered the site via Diwan-i-Am (Hall of Public Audience). Akbar used to rule the courts sitting in the middle of five seats located along the wall. The building was built to utilize the echo system, so the Emperor would hear anything that has been said within the open space. According to a legend, public executions were carried out there by letting elephants run over the people condemned to death. Then, we entered the Pachisi Courtyard, named after the game known in India as ludo. The huge game board is still visible in the middle of the courtyard, where Akbar is said to have played pachisi using, as the game pieces, slave girls dressed in bright dresses. 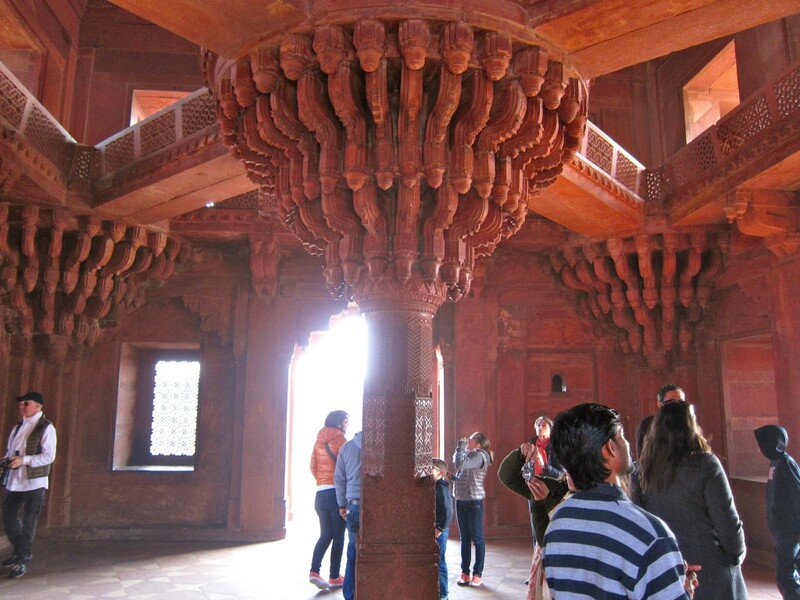 Diwan-i-Khas (Hall of Private Audience) is a building with a spectacular column, carved with geometrical and floral designs, supporting a singular elevated platform for Akbar. The Akbar’s seat is connected with four balcony seats by narrow stone brides. They say, Akbar modified the central column in order to draw attention to a new religion he called Din-i-Ilahi (God is one) which reflects the fusion of Islam, Christianity, Hinduism and Buddhism. 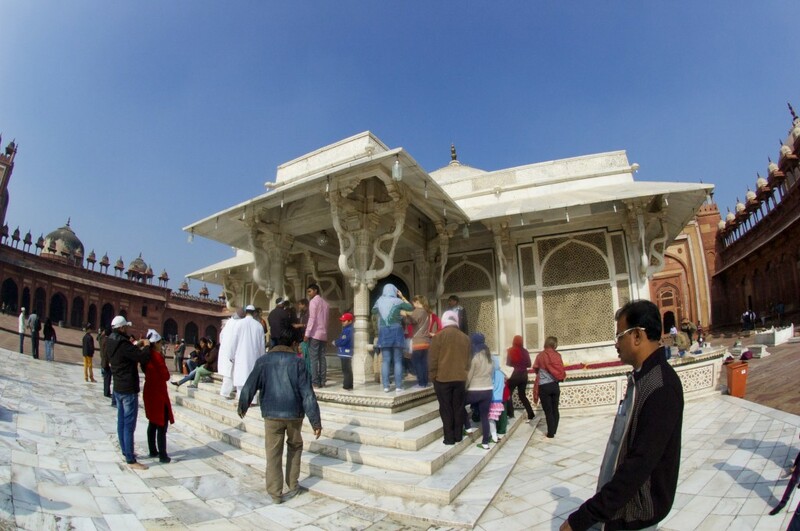 Next to Diwan-i-Khas is the Treasury and Astrologer’s Kiosk. 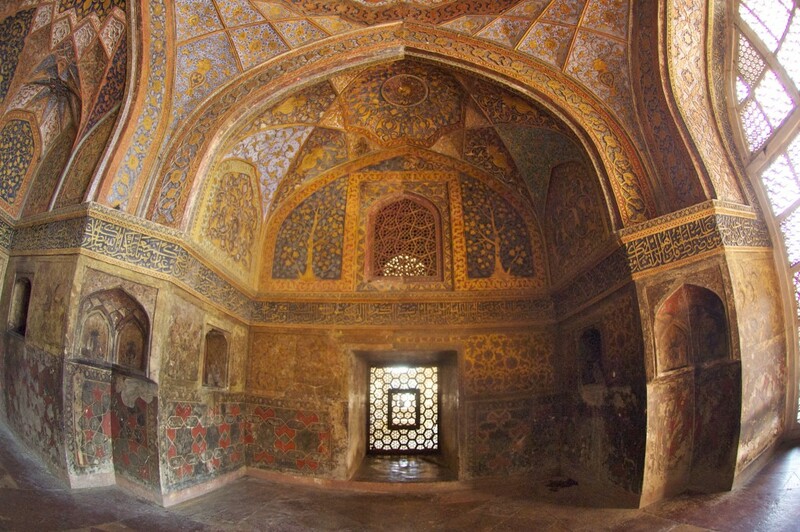 Separate palaces were built for each of Akbar’s wife -Muslim, Christian and Hindu (though, it is not clear whether he really had a Christian wife). According to our guide, Akbar’s favorite wife was Hindu princess from Rajasthan- Jodh Bai, however, the most luxurious pavilion (Rumi Sultana) was built for his Turkish (Muslim) wife. Akbar and his court enjoyed the poetry, dancing and music, which reflected in the palace with its large performance stages, vast manicured gardens, Ornamental pool and courtyards. 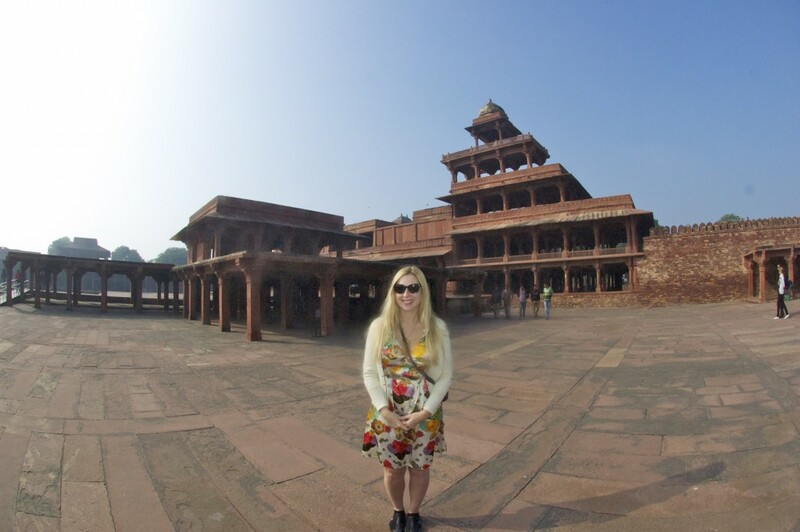 However, the most impressive building in Fatehpur Sikri is Panch Mahal – a five-story pavilion, narrowing to the top to compose a single large-domed chhatri. Stone jalis, which once separated the columns and covered the windows, proved that a pleasure palace was built for the ladies of the court. Behind the Anup Talao (Ornamental pool) is Akbar’s private quarters – Daulat Khana (Abode of Fortune) and Khwabgah (Dream House), a sleeping house with a huge stone bed facing a rising sun. Other notable buildings to see are Jodh Bai’s palace and kitchen, as well as elephant (or horses) stables. We were about to leave, when I saw a large crowd gathered on the other side of the fort, near a huge Mosque. Our guide was very reluctant to take us there, trying to usher us out of the premises as soon as possible, but I wasn’t leaving without seeing, what turned out to be one of the holiest Muslim places in India – Jama Masjid and a Tomb of Shaikh Salim Chrishti (the one who prophesied about Akbar’s heirs). Jama Masjid (built in 1571-1572) contains a large courtyard with the beautiful white-marble tomb of Shaikh Salim Chishti (completed in 1581). Surrounding it is a typical covered passageway for circumambulation with carved jalis. Just like many centuries ago, when Akbar came to ask Shaikh for a male heir, today, childless women from all over India come to his tomb to ask for a child and tie a thread to the jali. According to our guide, if her wish comes true, she must return, find her thread among thousands of similar ones and remove it. 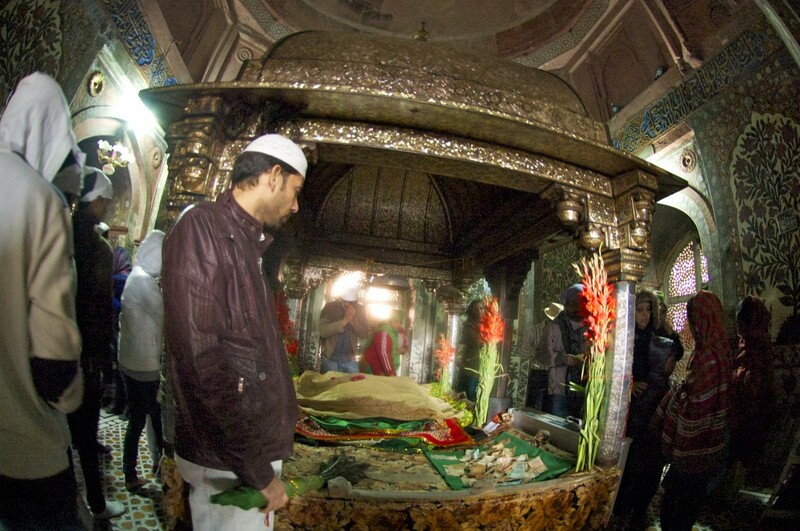 Sankalp was in a hurry to leave, that is why he didn’t show us neither the inside of Jama Masjid, nor the secret passage that reputably goes to Agra Fort, nor the last resting place of the Shaikh Salim Chishti’s grandson – Islam Khan. By the afternoon, the skies cleared out of morning fog, so we drove back to Agra to see the Gem of India and one of the seven wonders of the World – Taj Mahal (Rs.750). It is a Mosque, a tomb and the most recognizable monument of India, dedicated to the third (and favorite) wife of Shah Jahan, Mumtaz Mahal. She died giving birth to their 14th child and the Emperor never recovered from his loss. Before dying, she ordered her husband to build a mausoleum unlike anything else in the world and indeed, Taj Mahal won’t leave you unmoved. Its structure, combination of styles, perfect pink marble and semi-precious stones inserted in every inch of the building are incomparable. I highly recommend a book by Diana Preston “Taj Mahal: Passion and Genius at the heart of Mughal Empire” in order to understand the history and appreciate the value of this incredible building. 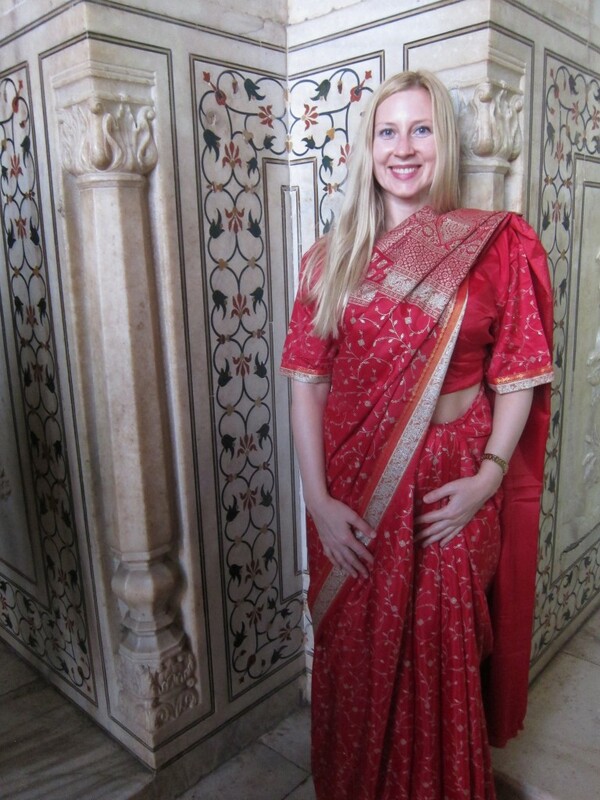 Before going to Taj Mahal, I asked Sankalp whether it was possible to dress up in a saree for our Taj Mahal photoshoot (it turned out to be a brilliant idea as we both looked really beautiful in a traditional dress). He was very accommodating (and no doubt collected the hefty commission fees) by advising us a shop where we could rent Indian clothes for me and Dimi (Rs.2200 for 4 hours) and also hire a professional camera man for Rs.4,000 (we negotiated). Taj Mahal (completed in 1653) is a love ode to a woman and “a teardrop on the cheek of eternity”. 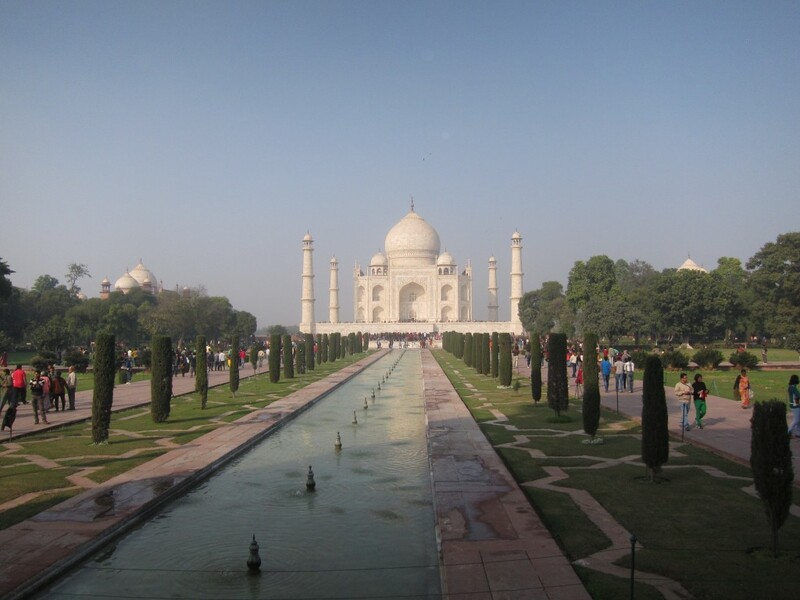 Even though, we spent 4 hours in and around Taj Mahal, it seemed barely enough. It was unbelievably crowded and apparently, full of stalkers who wanted to take pictures with us. Located in the middle of the garden, Taj Mahal, all sides of which are completely identical, stands on a marble platform surrounded by four 40m-high minarets. 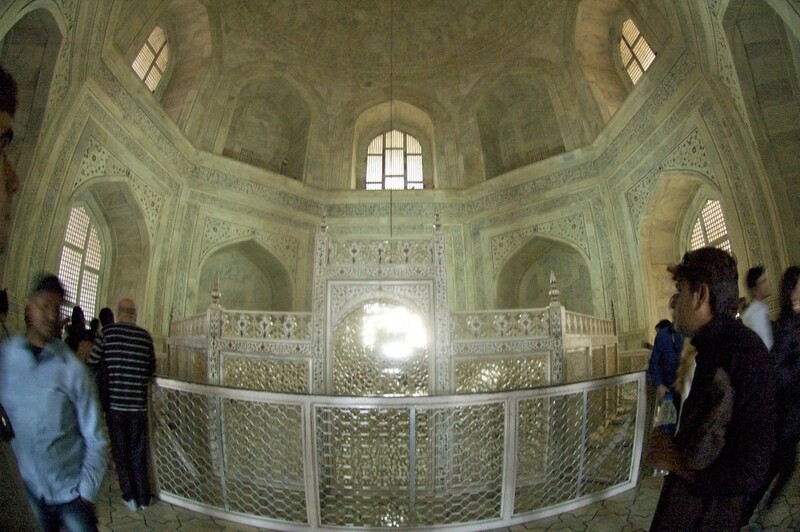 The main mausoleum is made of translucent white/pink marble, inlaid with semi-precious stones and carved with flowers. If you have a chance to visit Taj, please walk to another side of the Tomb and look at the Yamuna River; there, you can imagine the second Taj standing on the other side of the river and mirroring the original one- this is where Shah Jahan planned to be buried himself. However, his idea never came to life, that is why his cenotaph is visibly “squeezed” between the Mumtaz’ tomb and the jalis. 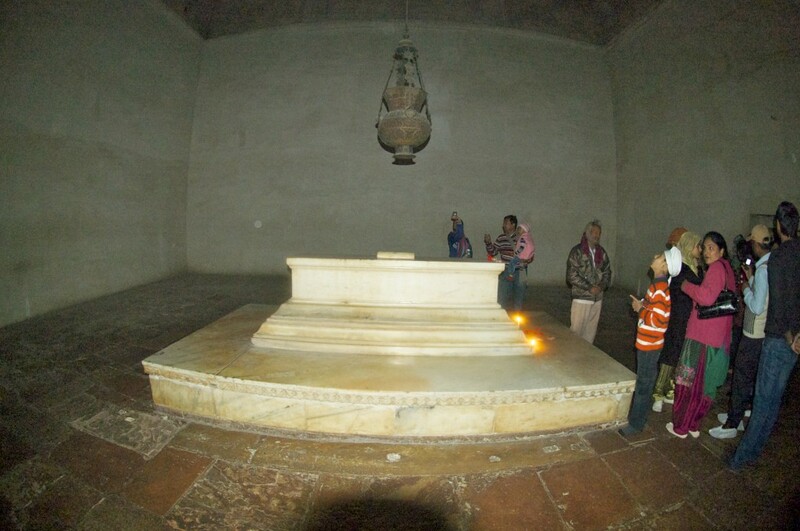 Please note, that the real tombs of Shah Jahan and Mumtaz Mahal are located on the basement level of Taj Mahal, and aren’t accessible to visitors. Sun was almost setting when we got to our last stop of the day – The Agra Fort. 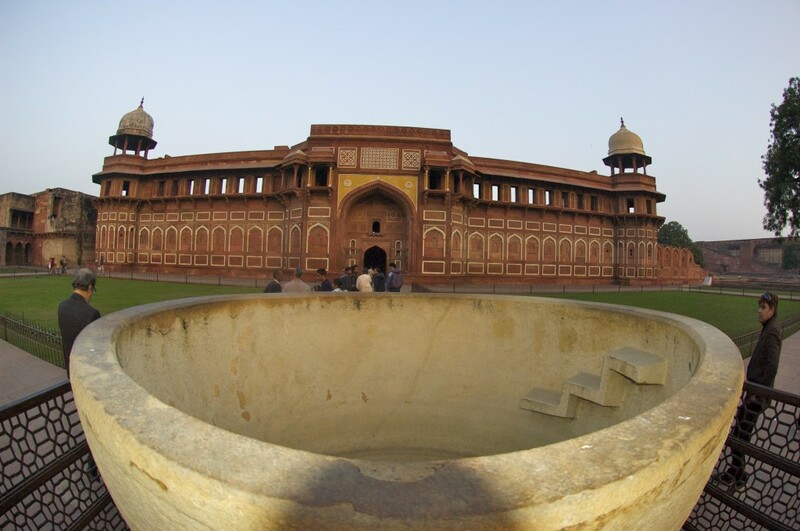 A massive red-sandstone structure is one of the finest Mughal forts in India. The original brick fort was built in Agra back in the 11th century; Sikandar Lodhi (1488-1517) and his son governed the country from this fort in the 15th and 16th centuries. The present fort’s construction started in 1565 by Akbar the Great who moved his capital to Agra, however, many buildings were added later by Shah Jahan who transformed the fort into a beautiful palace (eventually he was confined there for the last 8 years of his life, when his son, Aurangzeb, seized the power in 1658). We entered the Fort through Amar Singh Gate, and after passing the main courtyard, appeared in front of Hauz-i-Jahangir (a huge bowl used for bathing) and Jahangir palace, built by Akbar for his son Salim. Diwan-i-Am and diwan-i-khas (formerly housing the famous Peacock throne of Shah Jahan), along with Macchi Bhawan, Moti and Nagina Masjids (Pearl and Gem Mosques), Akbari Mahal and my favorite building – Khas Mahal are interesting sights to visit. The Agra fort has a vibrant and sad history; re-constructed and re-decorated by Shah Jahan, it served as his prison till 1666 when he died in Musamman Burj, overlooking Taj Mahal. Luckily, we were able to enter always-closed the Shish Mahal (Mirror Palace), walls of which are inlaid with tiny mirrors which at that time were worth more than gold. 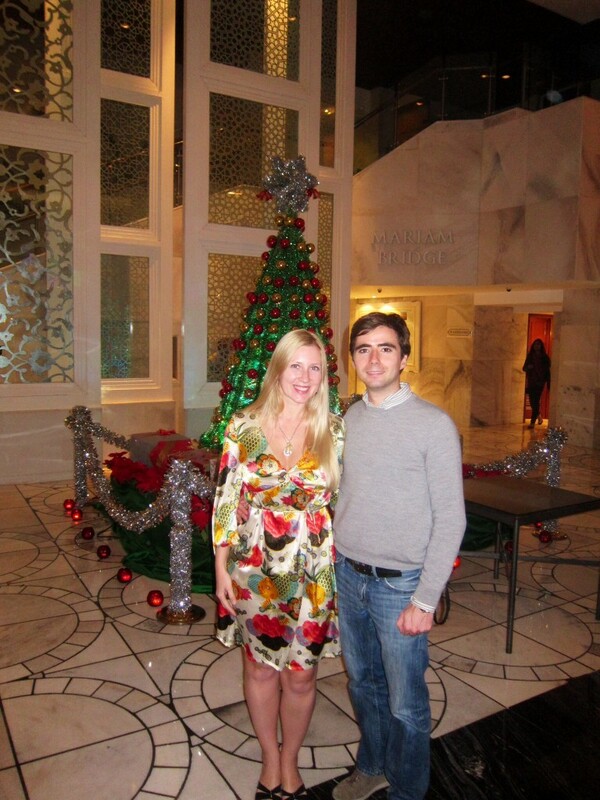 Our first Christmas dinner Dimitri and I spent at the hotel’s restaurant. It was delicious and romantic with a bush of plants getting on fire in the middle of our table. At the breakfast, people at the hotel’s restaurant asked us whether we were the couple that got married at Taj Mahal the day before. I guess our rental sarees and Shah Jahan’s turban paid off. After the breakfast, we climbed 3 floors up to take the last glimpse of Taj Mahal from the observation deck of ITC Mughal, before setting off to Sikandra. 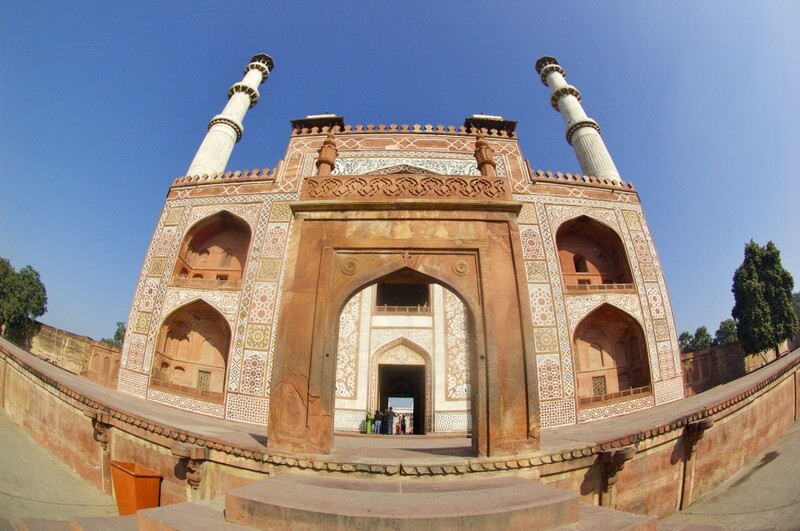 Akbar The Great (1555-1605) himself commenced the construction of his tomb in Sikandra in around 1600 (entrance -Rs.100). His last resting place is a reflection of his great personality and legendary acceptance of all religions and nationalities, thus it is a mixture of Hindu, Christian, Islamic, Buddhist and Jain themes. Akbar’s son, Jahangir completed the construction in 1613. Formerly, four getaways with bold red-white mosaic patterns lead to the the main mausoleum complex, only one is in use today. 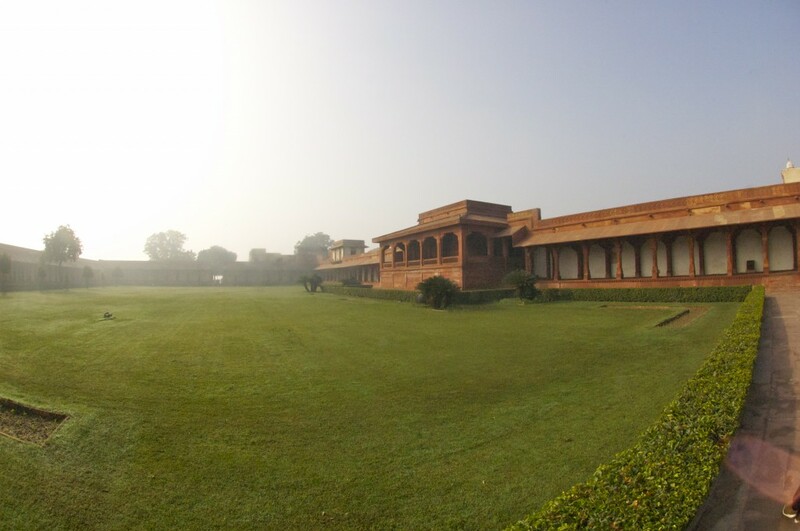 Main building is located in the middle of the garden, according to Muslim tradition and Akbar’s tomb is linked to the entrance by a long and narrow hallway. 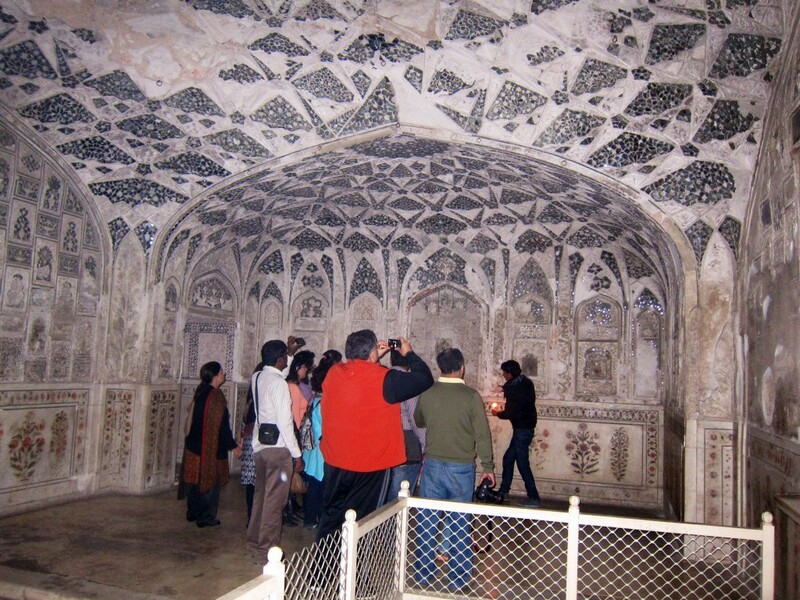 Akbar’s daughters Shakrul Nisha Begum and Aram Bano are also entombed in a richly decorated and jalied hall next to Akbar’s. 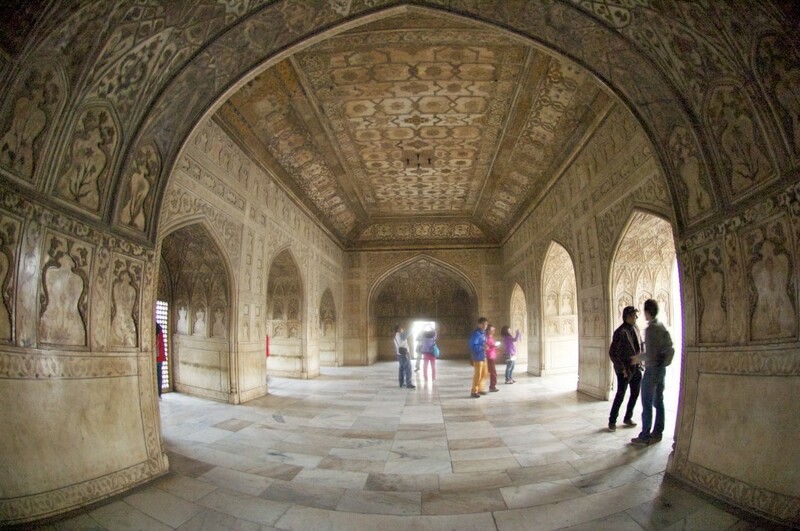 Visit to the Tomb of Akbar the Great was a great way to say goodbye to Agra and its World Heritage worth monuments. Agra is not an impressive town, but it possesses jewels unlike any other in the world, jewels that inspire love. This entry was posted in Asia and tagged Agra, Agra fort, Akbar, Akbar's tomb, Akbarabad, Akbari mahal, Anup Talao, Aurangabad, Aurangzeb, Babur, Battle of Panipat, British Raj, Chhatri, Daulat Khana, Deepack Sharma, Diana Preston, Din-i-Ilahi, Diwan-i-Am, Diwan-i-Khas, Fatehpur Sikri, Hauz-i-Jahangir, India, ITC Mughal, Jahangir, Jahangiri Mahal, jali, Jama Masjid, Jat people, jewel, Jodh Bai, Khas Mahal, Khwabagh, Lodhi, love, macchi Bhawan, Mahabharata, Maharshi Angira, male chauvinism, Marathas, Mariam-uz-Zamani, Mathura, menu for women, Moti Masjid, Mughal, Mughal empire, Mumtaz Mahal, Musamman Burj, Nagina Masjid, Panch Mahal, Rumi Sultana, Sankalp, sexism, Shah Jahan, Shaikh Salim Chishti, Sikandar Lodi, Sikandra, Taj Mahal, Tomb of Shaikh Salim Chashti, tripadvisor, Vrindavan. Bookmark the permalink. ← Vrindavan and Mathura, India. December 2013.